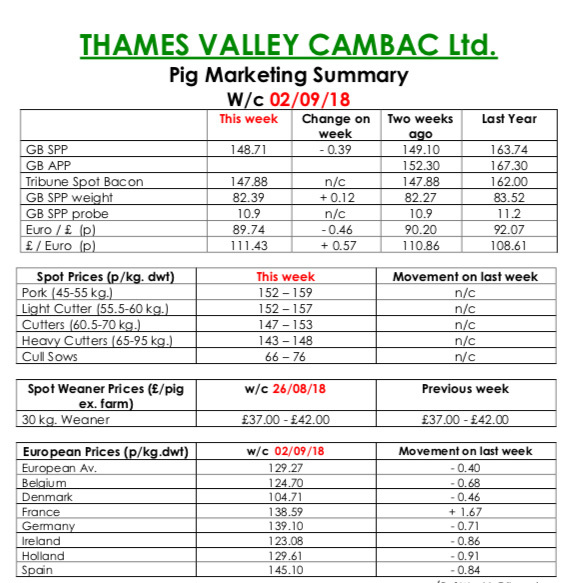 This week’s Slaughter Pig Marketing Summary, from Thames Valley Cambac, reported little change in market sentiment. Supply improved slightly, although average weights continue to struggle on some farms. Demand from the major processors was similar and all weekly contract contributions stood on. Thoughts now turn to better retail sales as the holiday season ends and children return to school. There will be a further promotional push by the AHDB this month focussing on pork medallions and loin steaks which will hopefully bolster demand. The fresh meat market was a touch livelier post Bank Holiday with decent demand seen from most outlets. The cull sow market was fairly well supplied and prices stood on. There was welcome stability in Europe as well with the influential German market standing on, and France the only significant mover, up 2.5 eurocents. All quotes in sterling were tempered however by a weaker Euro that ended the week down 0.46p at 89.74p. In the Weaner Marketing Summary, for week commencing August 26, there was little interest for any supplies outside contract arrangements. The spot market remained very difficult with some batches unsold. 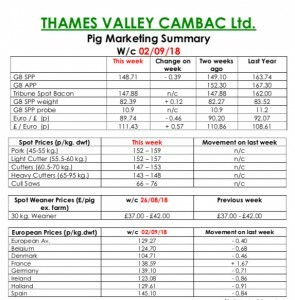 The prices announced by the AHDB saw no quote for a 30kgs pig and the weighted average for a 7kg fall by £1.16 to £37.35.